The debate over nature versus nurture in relation to intelligence is not as clearly drawn as it was ten years ago, when geneticists claimed that intelligence is innate, while environmentalists claimed that culture is the major determining factor. Although the debate has not been resolved, it has been significantly refined. 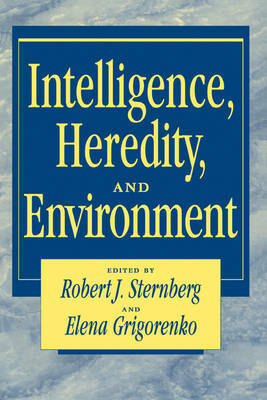 Robert Sternberg and Elena Grigorenko address the roles and interaction of nature and nurture in Intelligence, Heredity and Environment. This book provides a comprehensive, balanced, current survey of theory and research on the origins and transmission of human intelligence. The book is unique in the diversity of viewpoints it presents, and its inclusion of the very most recent theories and findings. It highlights the search for genes associated with specific cognitive abilities, interactionist theories, cultural relativism, educational strategies, developmental perspectives, and fallacies of previous intelligence research.